Another bunch of Ocarina of Time 3D screens popped up today alongside Nintendo’s most recent press release, including one showing off Castle Town’s new look! Follow the jump to see – and remember that we’ll also be posting these to our Ocarina of Time 3D screenshot gallery as soon as possible. Update: Aaaaaand there they are! You can view every official screenshot we’ve seen so far at our gallery page, also accessible from the Ocarina of Time 3D homepage. 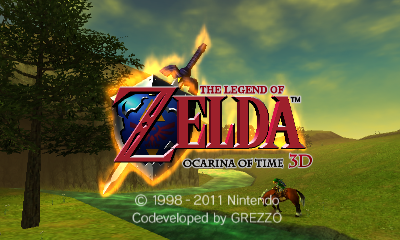 Don’t forget to bookmark our Ocarina of Time 3D walkthrough, since whether you’re a newcomer who needs some game help or an oldie wondering what’s changed in the new version, we’ll have something for you! Update #2: Even more screenshots have been added! This is insanity! All right, they should all be online. I ran into some technical difficulties running the image viewer on the UK site but managed to finish up using the South Africa site. I’m trying to avoid posting doubles so I’m not putting up every screen, but almost all of them are new. The main gallery will have to be updated later.